Tara Fox Hall's Blog - Posts Tagged "promise-me-series"
Lost Paradise, Promise Me Series Book #8 is OUT! Blurb: While the vampire Devlin rejoices at news of his impending progeny with Sar, werecougar Theo braces for more challenges to his Ranked title, content that after Sarelle has the dhamphir child Devlin will be out of their lives forever. Yet when The Lust reappears, Sar’s world again turns upside down as old hatreds make themselves known, resulting in a steamy affair with the weresnake Lash, a new friendship with the werecoyote Serena, and the severing of Sar from the last remains of her old human life in favor of a new Paradise with Devlin. Devlin hugged me tightly, then lifted me in the air as he whirled me around a few times, laughing, smiling radiantly. “Congratulations,” Lash said, giving him a wide smile. “We have to celebrate,” Devlin said, turning from Lash to me. Dark Solace, Promise Me #9, is OUT! Blurb: With Theo facing deadly odds in a fight to the death, Sar makes a pact with Lash, agreeing to give Devlin another chance in return for Theo’s life. Reforging her relationship with her handsome vampiric lover mends old wounds, even as Theo moves to regain Sar just for himself. But Devlin’s old enemy Ulysses appears, taking Sar prisoner and burning Devlin badly in a surprise attack. Rescued at the eleventh hour by Lash, Sar nurses Dev back to health, Theo bristling at a distance. Yet Lash’s own day of reckoning is here as his long life ebbs to a finale, leaving Sar to face the decision of offering him salvation, knowing that the price is her own humanity. Excerpt: “Ready to go?” Titus said gently. Then he saw the knife and letter in my hands. HUGE CONTEST! Win a catbed and Three signed Print Copies! First, I truly appreciate all your interest in my work, and your support since I began professionally writing in 2011. It's meant a lot to me to be able to share my stories and series novels with people who really cared about my characters as much as I cared about them. In 2015 and going onward, the Promise Me Series will be the only writing project that I will remain working on. Those books will continue to publish until the end of the series in very late 2016-2017. My "real life" job must be my priority for financial reasons, and I'm unable to balance that and my other responsibilities with my writing/promoting, so something had to give. I will not be on Facebook much, or online for the foreseeable future. But I'd be glad to answer any questions you might have via the Goodreads Ask the Author function on my homepage here at Goodreads. Tempest of Vengeance, Promise Me #11, will be out sometime end of February. Tempest of Vengeance Promise Me Series Book #11 Blog Tour! Beginning in late March 2015! Enter the rafflecopter below for your chance at 7 great prizes, including a signed PM book and heart catbed! Win a fall themed catbed in the Sundown & Serena CTR giveaway! 1 fall-themed catbed will be given away for US Residents, and 1 - 10$ Amazon giftcard for non-US residents! I've got 2 events coming up in February! 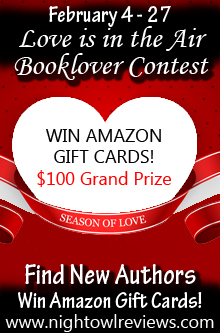 I'm one of the sponsors of the Night Owl Reviews Love is in the Air Scavenger Hunt. (Feb 4 - 27). Grand prize is a 100$ giftcard for Amazon! I'm also a contributor at TRR's Mega Anniversary and Valentine's party. (Feb 1-29th), with more than 500 prizes! Find some great new books and authors to read at these events. Make sure to check out my featured Promise Me titles, Hope's Return and my newest release for Feb 2016, Fate's Prison! Enter the I Love Vampire Novels Giveaway! Enter the Promise Me Series Giveaway! To celebrate the final Promise Me Series book publishing later this year, I am offering the first of many great giveaways in 2016! Writing a series is in a sense easier than writing stand alone books. The author can start a new book where they left off in the previous book. The longer the series goes on, the better the creator gets to know their characters, and how they’ll act, making what happens next easier to decide on. Yet this building up of knowledge and events is a double-edged sword, as the more past there is to draw on, the more the creator has to remember correctly. Some series get past this by evolving super slowly, or not evolving at all. Remember Sweet Valley High? Those blonde twins were in high school for many, many books. Time almost didn’t seem to pass, and past references were few and far between. Other series take a particular place instead of a couple, and focus on the different characters living there, so that major events are referenced, but many minor ones specific to certain families or couples don’t have to factor into sequels. Therein is the hardest part of writing a series: the author needs to address the events that happened before in previous books. While that isn’t hard when starting book two, an author starting book number fifteen will have to do a significant amount of research to make sure that their characters are true to form and previous history. Another necessary aspect of continuity is addressing the passage of time. In reality, humans change as they go through life as a direct result of events they weather and celebrate, experiences they accumulate. Good people can become bitter, and villains can become heroes. Settings change with development and decay; stores and landmarks there one decade can be gone the next. Friends that we are close to when we are young are often not in our list of friends when we’re adults. Change is inevitable as we grow and mature, get jobs, get married, or grow apart in values and ideals. Lastly, there is series progression. Usually, each book has a few specific conflicts that are resolved by the book’s end, be it a couple getting back together, a murder being solved, a villain getting his just deserts, etc. Readers want to see a series evolve, for things to change for the better (unless it’s a horror series, lol). A really great series has multi-book arcs that go through lots of twists and turns before their conclusion. A spectacular chain of novels has this plus a great arc that runs through the entire series. 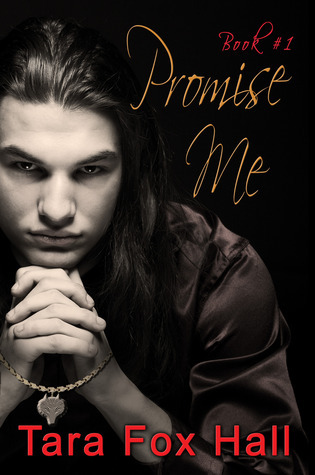 I’ve tried for continuity in both my Promise Me and Lash series, checking again and again for date/event errors, a solid progression of character evolvement and believability, and many story arcs within each book and throughout several books. Do I have a great arc in mind? Yes, I’m working on it!